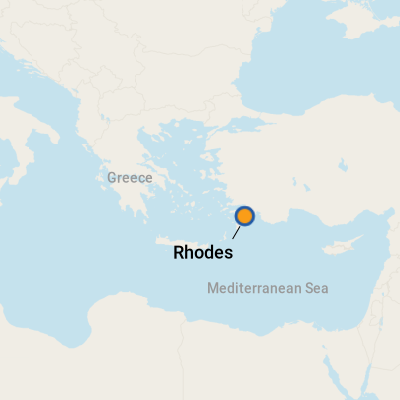 Rhodes, with an average of 300 sunny days per year and mild temperatures in the winter, has been a popular tourist attraction for centuries. Located 12 miles off the coast of Turkey, it's the largest of Greece's 12 Dodecanese islands. Rhodes sits in the Aegean Sea, and its beautiful blue green waters reflect a tropical paradise. The island features 35 beaches and many cultural and historical attractions. 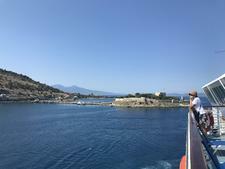 The view from the sea is spectacular as you sail into the port of Rhodes. It's one of the best preserved medieval towns in the world and a UNESCO World Cultural Heritage site. 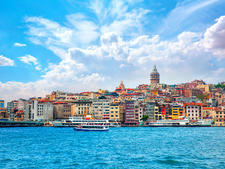 The ship disembarks its passengers just outside of Old Town, a maze of cobblestone streets, flanked by historic buildings dating from the 14th century. Between the city's sturdy walls, magnificent palaces, fascinating museums and ornate mosques line the narrow, atmospheric passageways and carefully planned squares. Souvenir shops, restaurants and boutiques are plentiful in Old Town. The main attraction here is the Palace of the Grand Masters, built in the 14th century by the Knights of St. John. The structure survived an earthquake but was destroyed by an explosion in 1856; it was later restored by the Italians in the 1930's. Now a museum, the palace contains priceless mosaics, sculptures and exhibitions of medieval and ancient Rhodes civilizations. 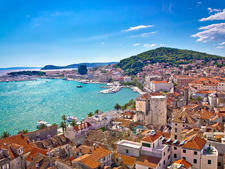 But it is not just Old Town that attracts visitors to this beautiful island. The New Town, located across Mandraki Harbor from Old Town, contains a large marketplace, the Nea Agora, which contains a food court, gift shops, cafes and bars. New Town also offers many luxury hotels and beautiful beaches that attract vacationers who enjoy paragliding, windsurfing, swimming and sunbathing. A casino also is available for those who want to try their luck at games of chance. Cruise ships offer half-day tours that include Old Town sites and full-day tours that include jeep tours of the island and visits to the ancient city of Lindos with its cliffside acropolis, whitewashed houses and picturesque scenery. Guided tours and excursion boat tours are also available, but just walking around with a guidebook will be enough to enjoy this interesting and picturesque part of the world. Ships dock at the port located on the north tip of the island, about a 10-minute walk to town. The port offers easy access to ATM's, Internet cafes and shops in town, but there's not much at the port itself. Taxis stop at the port for passengers who want to explore the New Town or other areas. Uneven pavements and cobblestones. Also beware of the heat, which can catch you unawares as you're browsing. Wear a hat, sunscreen and carry bottled water to avoid dehydration. When dining out, a service charge is included in the price of meals on the menu, but you can add an additional tip if you feel the service was exceptional. When visiting mosques, it is advisable to wear respectful attire: long pants or long skirts and head coverings. Also, taking photographs inside churches is considered disrespectful. Rhodes' Old Town is easily explored on foot, but wear comfortable shoes. Taxis are also plentiful. The currency is the euro. This island is the top tourist destination in the Dodecanese, and the proprietors certainly don't want you to run out of cash -- so you'll find plenty of banks, currency exchanges and ATM machines. For current currency conversion figures, visit www.oanda.com or www.xe.com. It's Greek, but English is widely spoken. Rhodes is filled with charming Greek tavernas, both in the Old Town and New Town. You can sit at outside tables and enjoy the extraordinary cuisine of the region. Bread, olives and olive oil, dishes made with cereals, vegetables, dried fruit, fish, chicken and seafood are staples of the area. Try pourgouri, small balls made of veal, onions, tomatoes and olive oil. Small plates with appetizers such as olives, hummus and grape leaves are often served at restaurants in the area. Make sure you check menus before ordering and know exactly what you want. Sometimes water will come with a charge, or waiters may misinterpret your request for a small beverage and substitute a higher-priced item. Great choices include handmade lace, excellent leather goods, olive oil, jewelry, colorful pottery from Lindos and bowls carved from olive wood. Locally produced honey is also an excellent souvenir.